In the past, Amazon.com has shown interest in selling cars, even to the point where they actually implemented it. 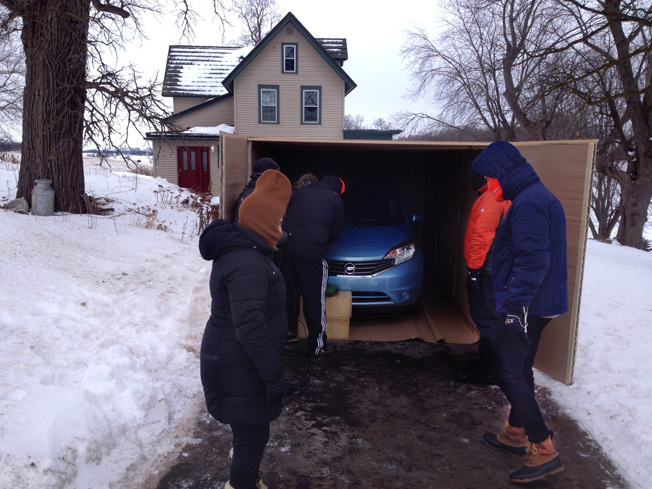 You could buy a Nissan Versa from Amazon and it would be delivered to your house, in a box. The car would be on a flatbed in a giant box delivered right to your front door, removing all the hassle of buying a car from a dealership. This was only used in a small number of tests of a few hundred vehicles actually being sold, however making for a series of interesting pictures or the internet. But in recent news Amazon has started to show signs of their growing interest in selling cars to the masses. Amazon plans to start its sales in Europe they will be working with a Belgium based company to begin to offer cars to German consumers. In the past couple of months, Amazon has either acquired or partnered with other companies to enter new industries. Their recent purchase of Whole Foods is assumed to be an attempt to enter the grocery market industry. This is a great example of Amazon’s rapid expansion. The car industry may be the next logical next step for Amazon as millions of new cars are sold in America each year alone. If Amazon could get a part of those sales it could lead to huge improvements in their sales numbers and Amazon’s overall revenue. Purchasing cars online isn’t entirely a new idea. Many manufacturers allow for you to choose and design your own customizations to the model car you want and then give you the options to see if the car you want is available at any local dealers. If it is not, then you may be given the option to place a special order for your specific car. However, this option is mostly reserved for those cars that have something special about them, such as the Ford Mustang GT to the Tesla Model S and 3. This allows the customers to be able to get their cars just to their liking. If Amazon were to start to sell cars on their website, it would allow them to easily add customized features, making sure their customers are happy with their new car. Despite some benefits, not being able to get behind the wheel of the car before purchasing is likely to deter consumers from buying online. Amazon started by launching a database for consumers to gain access to reviews, ratings, and all sorts of data about a new car, Providing consumers access to information about a car before purchase. This is a necessary foundation required before Amazon could start selling cars online. Amazon does not plan on creating their own cars, rather to just become a national dealership. The test in the UK will play a large roll to see if this will be viable for Amazon. On average in the US, 42,000 new cars are sold every day, most of which are under lease or financing. This could force Amazon to have to partner with a bank or local dealership to be able to provide financing for its consumers. Since most of new cars purchased are either through financing or lease it would not be as simple as purchasing most other products off Amazon. As a buyer would have to go through credit checks and approval for a loan. A process that Amazon will most likely want to stay out of. If Amazon believes they can get a small piece of that, then it would make a lot of sense for the retailer to jump into another industry. In recent years, Amazon has shown a lot of interest in expanding as much as possible and their plans in the UK and Germany demonstrate their interest. One thing that may make it hard for Amazon to sell cars in the US is the size of American cars. As long as the American car industry has existed, it has always been building large cars. There are not as many sedans anymore. If Amazon wanted to sell trucks in the US, it would run into a series of problems shipping those trucks across the US. Just due to their size, many large trucks would have to be shipped differently than normal cars, as they wouldn’t fit on the car carrier as easily. Amazon has a huge opportunity in front of them as long as consumers accept the idea of buying a car online. With the car industry heading for a series of changes, it is questionable if Amazon is too late for joining the industry. If they find a way to sell cars, maybe Amazon could dominate another industry. Ausick, Paul. “Global New Car Sales in 2013 Top 83 Million; Sales Forecast Higher for 2014.” 247wallst.Com, 16 Feb. 2014, 247wallst.com/autos/2014/02/16/global-new-car-sales-in-2013-top-83-million-sales-forecast-higher-for-2014/. Reporter, Sophie Christie Digital Consumer. “Amazon Is Planning to Sell CARS as Online Retail Giant Starts Hiring New Dealer Sales Staff.” The Sun, The Sun, 14 June 2017, www.thesun.co.uk/motors/3795815/amazon-is-planning-to-sell-cars-as-online-giant-starts-hiring-new-dealer-sales-staff/. Ramey, jay. “Would You Buy a Car from Amazon?” Autoweek, 13 June 2017, autoweek.com/article/car-news/amazon-wants-start-selling-cars-online. Lynch, Jim. “Amazon, Others Have Potential to Disrupt Auto Industry.” Detroit News, 2 Aug. 2017, www.detroitnews.com/story/business/autos/2017/08/02/amazon-disruptors-auto-industry/104231090/.